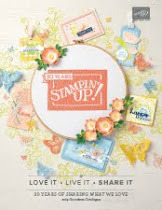 Today is the beginning of Stampin' Up's Saleabration and the launch of the new Occasions catalogue. 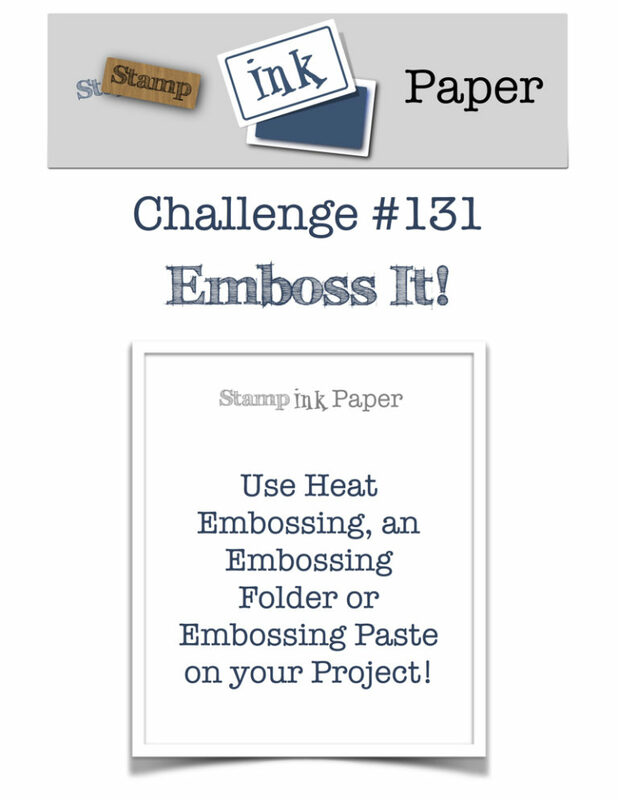 I was playing around with one of my pre-earnt Saleabration items this morning when I saw the challenge at Stamp, Ink, Paper. 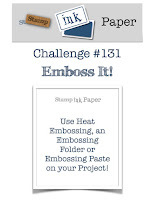 Who doesn't love embossing?! 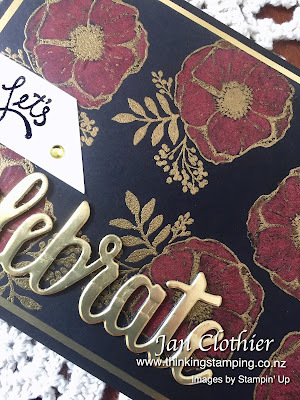 As it happened, I'd seen on-line a wonderful card by Gail Davidson which inspired me to try out this card today, using the Amazing You stamp set and Celebrate You thinlit dies - both Saleabration items. The flower stamp is gold embossed onto black, then coloured with Real Red watercolour pencil. This is on a gold foil mat, then adhered to a Basic Black cardbase. The gold foil 'Celebrate' is stacked on three black cuts of the same die to give it some dimension. The 'lets' is black embossed to add some more shine. If you live anywhere in New Zealand and don't have a Stampin' Up demonstrator, I'd love to help you with ideas and Stampin' Up products. If you would like a copy of the new Special Occasions Catalogue and don't have a demonstrator, then contact me. You can message me through my Facebook page, linked in the sidebar of this blog or leave a comment below. 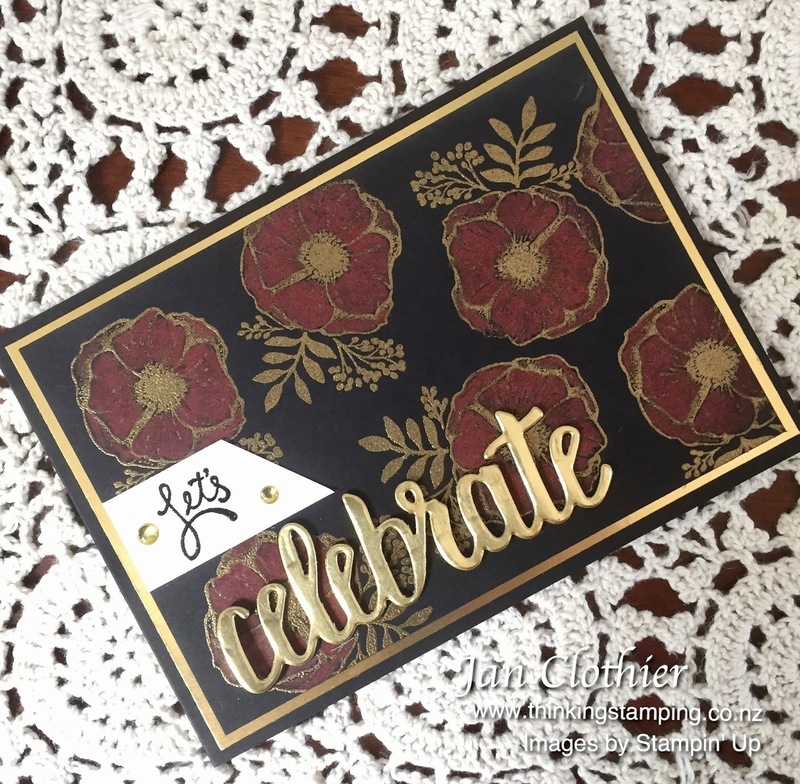 Other: gold and black embossing powder, Celebrate You thinlit dies, metallic enamel shapes, Real Red watercolour pencil, double-sided adhesive sheet. Just beautiful! Love the way that your flowers turned out, great colors and design! Thanks for joining us at Stamp Ink Paper, hope to see you again soon!